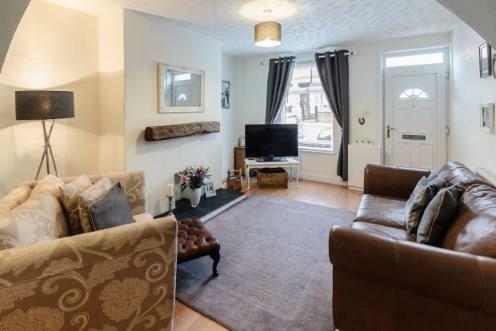 2 Bedroom Terraced House For Sale in St. Helens for Offers Over £70,000. Entwistle Green are delighted to welcome to the market this perfect first time buyer home. Comprising of lounge, dining room, kitchen and bathroom to the ground floor. To the first floor there are two double bedrooms. The property benefits from being double glazed and central heated. Must be viewed to be fully appreciated. Radiator, laminate flooring, ceiling light. Stairs leading to the first floor. Double glazed uPVC window. Tiled flooring, tiled splashbacks. Roll top work surface, wall and base units, stainless steel sink and with mixer tap, space for, standard hob, space for washing machine, fridge/freezer. Double glazed uPVC window facing the side. Heated towel rail, tiled flooring, tiled walls. Built-in WC, panelled bath with mixer tap, shower over bath, vanity unit and wash hand basin with mixer tap. Double glazed uPVC window facing the rear. Radiator, carpeted flooring, built-in storage cupboard, ceiling light.